Two-way or three-way? You decide! 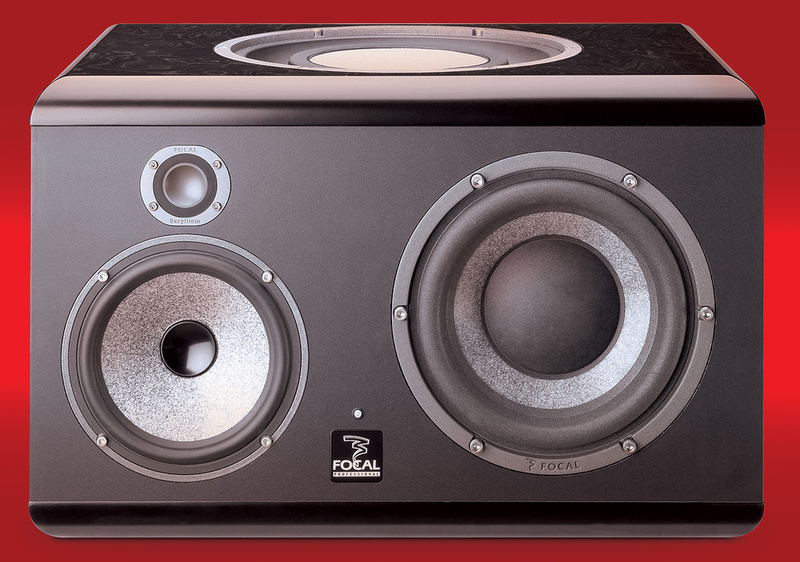 This premium nearfield speaker from Focal is unique in offering both full-range and band-limited listening modes. 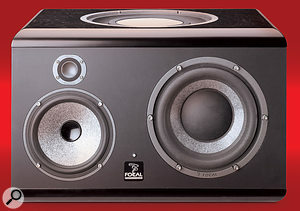 There are few studio monitor makers who, like French company Focal, design and manufacture both the cabinets and the transducers used in their products. Focal's total control of their development and production, coupled with the design aim of delivering "the absolute acoustic truth,” has produced some of the most highly regarded speakers in both recording studio and domestic hi-fi circles. Their latest range-topping studio monitor, the active, three-way SM9, is an all-new product that features the latest generations of Focal's signature transducers. The major innovation of the SM9 is that it has been designed to be two loudspeakers in one: a highly accurate, 30Hz-40kHz three-way speaker or, in 'Focus' mode, a bandwidth-restricted two-way system that allows the checking of EQ and balance in the mid-range, as well as the transfer of a mix to more modest domestic systems with limited frequency responses. The very first thing that you notice about an SM9 is its weight. At 35kg each, they make even a short flight of stairs seem longer than you remembered, and necessitate sturdy stands for support. Once they're free of their individual packaging, you'll find yourself looking at a mirror pair of surprisingly small, stylish, 'landscape' mounting black boxes, with the main drivers filling the front, a passive radiator in the centre of the top and a rear panel dominated by a massive heat-sink. The front-panel driver layout is that of a two-way monitor with a larger bass driver sitting to the side. The cabinet itself is divided internally into two entirely separate, sealed sections, one containing the treble and mid-range drivers and the other the bass driver and passive radiator. The front panel also carries an LED that indicates both operating and fault statuses. In addition to the aforementioned heat sink, the rear of the cabinet carries the amplifier EQ controls, an XLR audio connector (switchable between -10dBu and +4dBV sensitivity) and an IEC power connector. The EQ section is made up of a high-pass filter and a separate equaliser. With the high-pass filter at its full-range setting, the filter is bypassed, while three other settings bring in a 12dB/octave filter at either 45Hz, 60Hz or 90Hz. Then there's the five-band EQ, each band having a range of ±3dB, in 0.5dB steps. The low shelf operates in the range of 30-250 Hz, while the separate low bell filter is set at 50Hz. The low-mid EQ is centred on 160Hz, and is designed to deal with reflections that can arise when the SM9 is mounted on a console meter bridge. The mid-range band is centred at 1KHz, and the HF shelf takes care of frequencies between 4.5kHz and 40kHz. A small control panel on the inner side of the cabinet carries the standby/on switch, the Focus switch that turns the SM9 into a two-way system, and a Direct switch, which bypasses the rear-panel equaliser, but not its high-pass filter. The button for activating Focus mode is on the side of the monitor, alongside the standby/on switch and EQ bypass button.For the SM9, Focal's proprietary inverted-dome beryllium tweeter has been given a new magnet structure that produces a whopping 2.1 Tesla of magnetic flux. Focal believe that this high flux level enhances that tweeter's ability to reproduce high-frequency, micro-dynamic detail, thus helping engineers to hear more clearly the detail of compression and reverb. The brand-new mid-range, bass and passive drivers in the SM9 feature Focal's 'W' composite cone, which is made up of a structural foam core sandwiched between two sheets of woven-glass fibres. Driving these transducers are three all-new, all-analogue amplifiers, each operating in Class-AB mode, with 400W for the bass and 100W each for mid-range and treble. The quoted frequency response in full-range, three-way mode is an impressive 40Hz - 20kHZ (±1dB), expanding to 30Hz-40kHz at the ±3dB points. In three-way operation, the crossover points are at 200Hz and 2.5kHz, and in the two-way Focus setting, the response is restricted to 90Hz-20kHz (±3dB), with the single crossover point remaining at 2.5kHz. The SM9 is designed for use in the nearfield at between one and four metres from the listening position. Once you've lifted them into position, setup is simplicity itself, as there are only power and audio connectors to worry about. Having removed the drivers' protective covers and powered up the speakers (accompanied by a chattering chorus of self-cleaning relay switches), I embarked on the recommended 20 hours of running in before beginning critical listening. Once the drivers had settled down to the task at hand, I took a few hours listening to a wide variety of material across multiple genres and spent part of that time assessing the effects of the SM9's EQ controls. The high-pass filter is extremely effective at cleanly removing successive sections of the bottom octave and a half of bass between 30 and 90 Hz. I did find myself wishing that the high-pass controls were accessible on the side-mounted control panels, as the SM9's bass response makes any lack of care in, or control of, the low bass content of a track painfully obvious. I came across several instances where filtering out this kind of out-of-control signal greatly enhanced the musical experience, and the SM9 high-pass filter would be a useful quick check before commencing any clean-up. The SM9's onboard EQ is designed to allow you to compensate for anomalies in your listening environment, and the range of the individual EQ bands and their overlaps are well chosen for that purpose. Fortunately for me, my listening room doesn't require any EQ, so I didn't need to use this feature, but it certainly works. A row of knobs on the back panel below the heat sink adjust the SM9's built-in five-band equaliser and high-pass filter.Listening to the SM9 in full-range mode is an illuminating and revelatory experience. As with all really good monitors, you tend not to notice just how loud you are running them until you try to hold a conversation in the room. The SM9 is capable of producing a peak SPL of 116dB at one metre, although I didn't try to confirm that particular parameter on Health & Safety grounds, as my dear neighbours can be a bit violent when roused. At more realistic levels, the detail and overall balance across the frequency spectrum was, quite simply, among the best that I have come across. The smallest sonic subtleties simply presented themselves in the soundfield, and picking them out became a seemingly effortless task. The dynamic response of the SM9 is so fast and defined that instruments and voices are distinctly delineated, each seemingly occupying its own point in space and time, and this is probably the reason why tiny details are so easy to hear. Sounds were precisely positioned within the stereo image, which also exhibited an extremely naturalistic width and depth. Switching to the two-way Focus mode resulted in a very noticeable change in the sound, without affecting its character, and certainly achieved Focal's design objective of allowing concentration on the mid-range while also approximating a lower-quality system. With the bottom octave and a half removed and the -3dB point on the treble pulled down to 20kHz, Focus mode certainly restricts the sound of the SM9, but doesn't create an unlistenable mini-me. Instead it gives you a searchlight that ruthlessly exposes problems in the mid-range. As an aside, pulling the -3dB point down from 40kHz to 20kHz also highlights what you lose when that extra octave disappears. Finally, I have to give special mention to the bottom-end response and control of the SM9. Tracks with a bottom end that forces my active main monitors into pumping gusts of air out of their ports and sounding a tad slow come across sharp and cleanly timed on the SM9. Arguably, that might be as expected, since the SM9 is around twice the price of my current monitors, but I have no doubt that the way the passive radiator is implemented in the SM9 is much more likely to be the real reason. The Focal SM9 is a very special monitor system indeed. In three-way mode, it demonstrates a level of dynamic detail and tonal balance across the audio spectrum that lower-cost monitors can only envy, and that a good few more expensive monitors will struggle to beat. In two-way mode, it becomes an extremely effective analytical tool, and I have the distinct feeling that this 'multi-monitor mode' idea will be seen more and more in the future. There is no doubt in my mind that the Focal SM9 is one of the finest monitors in its class available today. The level of performance packed into its modestly sized cabinet is extremely high and more than justifies its asking price. If you are in the fortunate position of being in search of a nearfield monitor at anywhere around or above its price point, the SM9 is a monitor that you really have to audition. For my part, I've started saving already! To reach this level of performance, you'll have to look for similarly reassuringly expensive monitors from companies such as Adam, ATC, Dynaudio, Eve, Genelec, Klein & Hummel, PMC and Quested. Focal are the only company that I know of to use a passive radiator setup in a reference monitor at this level of price and performance. In general terms, a sealed cabinet delivers a precise transient response at the expense of a reduced bass extension (without going for a very large cabinet) and low efficiency, while a ported cabinet improves efficiency and can extend the cabinet's low-frequency range, even in a smaller cabinet, beyond that which the bass driver can achieve on its own. The transient response of a ported design is usually not as good as that of a sealed box, however, which can lead to a 'slow-sounding' bass. Another big issue with a ported cabinet operating at high SPL is that turbulence in the port can create noise. A passive radiator is basically a loudspeaker minus its magnet and voice coil, and it works on the same principle as a port. Rather than being driven by a voice coil and magnet, a passive radiator resonates when the active driver produces the low-frequency range that it has been designed and tuned to respond to. This range lies on either side of the radiator's resonant frequency, and by tuning it so that it begins to resonate as the active driver's output starts to fall, an extra half an octave or so of bass extension can be added. 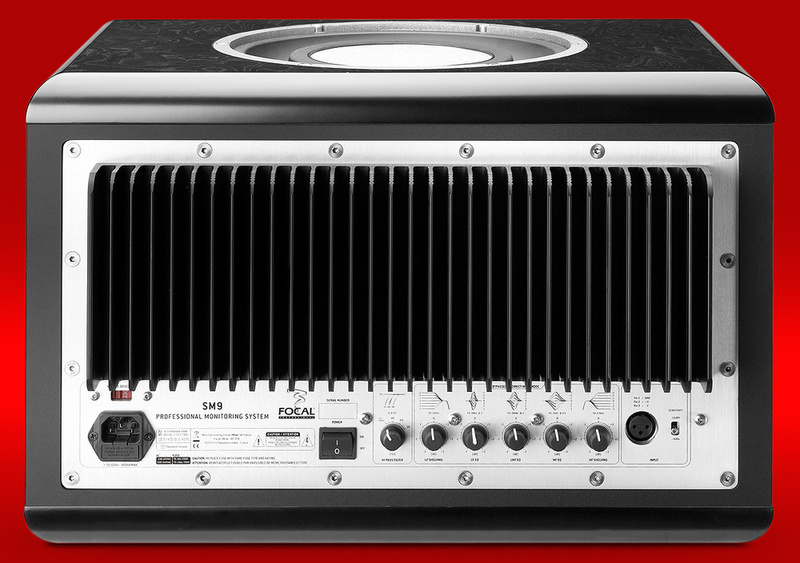 The radiator's resonant frequency is tuned so that the combination of active driver and passive radiator at the lower bass frequencies gives the same level as the bass driver on its own at higher bass frequencies. The main drawback of a passive radiator is that its output is always — to a greater or lesser extent — out of phase with the bass driver. Our ears and brain are most sensitive to sudden changes in overall phase relationships, however, so we tend not to notice this phase difference. On the plus side, a passive radiator design is very efficient and, because it allows precise control of its resonant frequency, it can deliver a better transient response and a tighter, more defined and extended bass at a higher SPL than an equivalent ported system, without any risk of port noise. The design can also allow (as in the SM9) the use of a smaller-diameter bass driver, which can result in better response at higher bass and low mid-range frequencies. If you want to explore the passive radiator concept in more depth, a web search will throw up a number of very informative sites. Two distinctly different monitor modes. 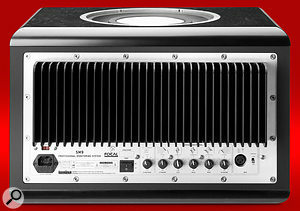 Wide bandwidth with great dynamics, detail and tonal balance. Passive radiator design gives extended bass response. 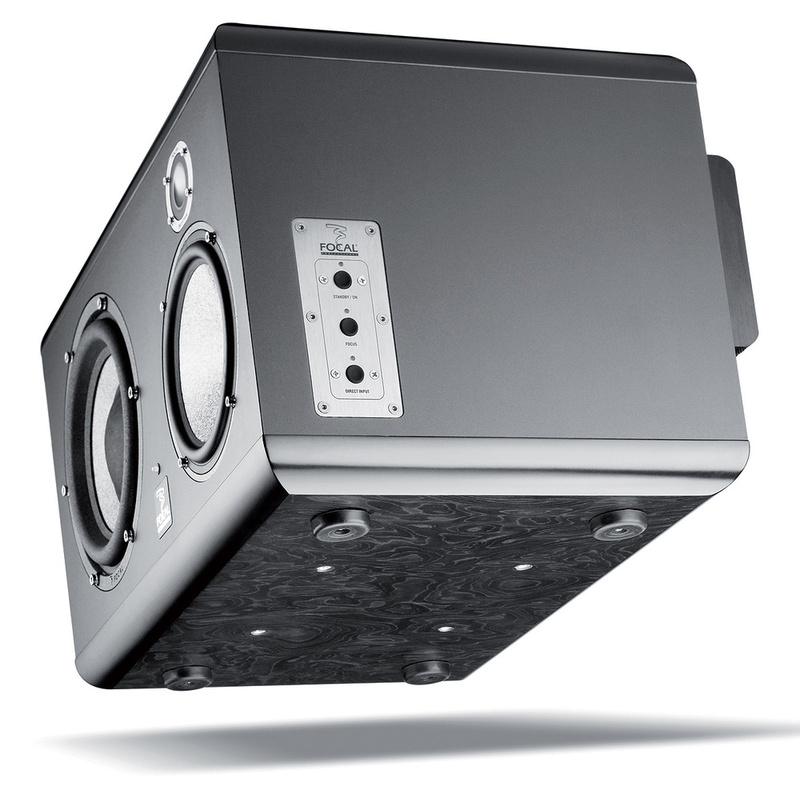 A relatively compact, passive-radiator enclosure delivering performance more commonly found in sealed-cabinet loudspeakers, the Focal SM9 is a significant new addition to the monitor market. An innovative two-way/three-way design adds versatility, and the high level of audio performance makes the Focal SM9 one of the finest monitor systems in its class. £4725 per pair, including VAT. Audio Plus Services +1 800 663 9352.